Join Stitchin' Heaven and Friends on a 7-night Eastern Caribbean Cruise sponsored by Frond Design Studio! Cruise and learn from three quilting experts: Stephanie Brandenburg, Pam Goecke Dinndorf, and Amy Walsh! As usual, we bring you several quilt projects to work on, taught by amazing and talented instructors and designers in the world of quilting: Stephanie Brandenburg, Pam Goecke Dinndorf, & Amy Walsh! 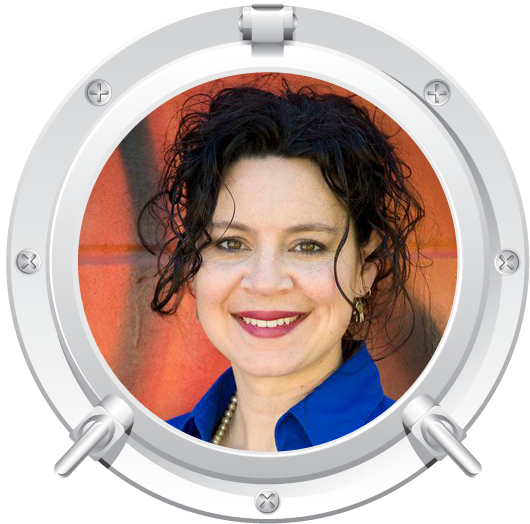 Stephanie Brandenburg is the owner and creator of Frond Design Studios. 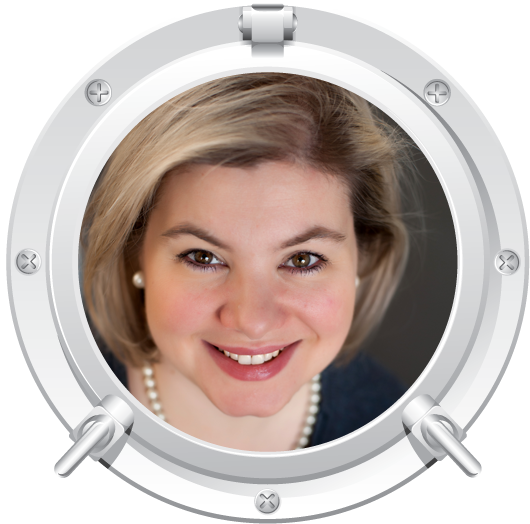 Stephanie attended Coe College where she earned a Bachelor of Arts in History. Her goal had been to become a lawyer but raising her daughters and taking care of a household while working full time at her mother’s shop, Fern Hill, led her down a different path. At Fern Hill she marveled at the hand made items people would bring in to sell. There was a real connection between the artisan and the work. She loved to help people pick out beautiful colors to put their own quilts together. Stephanie has always been confident in her sense of color. That bold color comes through in every painting that she does and every fabric she directs! She was truly inspired by the people she met at the retail quilt shows through her mom’s shop, Fern Hill Giftsand Quilts, and they fueled many designs. People would come up and tell her how inspired they were by her work, some people even learned how to sew just to sew with her designs! They would request certain flowers and what they represented to them. So Stephanie has always seen her designs as an exchange, an open forum. That is the beautiful thing about art in fabric, it is a relay race of creativity. 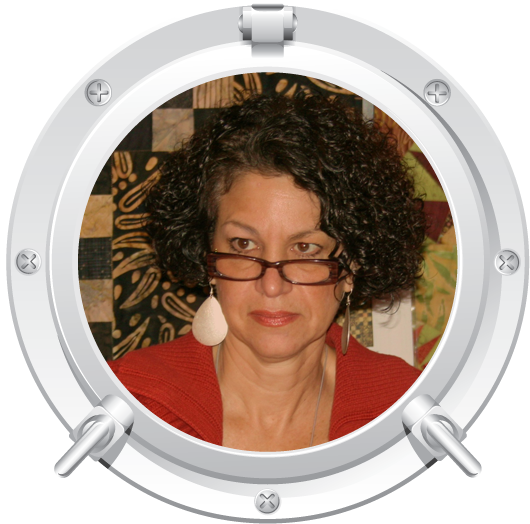 Pam is the owner and creator of Aardvark Quilts. Pam has been obsessed with the magic of color since as far back as she can remember. Her career path has followed that carrot through several avenues: fashion, interior design, and now quilt design. Inspired by vintage quilts and the plethora of repetitive shapes in the world around us, she designs somewhat simple patterns that allow you to revel in the joy of combining powerful colors and prints in dynamic concoctions. Pam's most recent offering is a collection of gloriously colorful fabrics, Medusa, distributed by Frond Design Studio. Her first book, Colorific from C&T Publishing, released last year, details her color process. 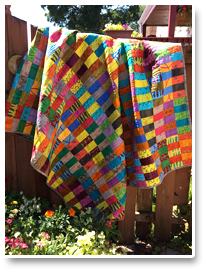 Pam can also be seen in Quiltmania, Quilty, Modern Patchwork, Quilt, Kaffe Fassett's Quilt Romance and others. Pam enjoys sharing her love of colorful quilts with others through lectures, workshops, and shows throughout the country. When she is not in her studio quilting or writing, Pam loves spending time with her family. Pam resides in central Minnesota with her husband Pat, daughter Sydney, and sons Egan and Elias. Amy has been quilting since junior high when her mother and grandmother taught her to hand piece. A love of pattern and color kept her building her fabric stash throughout college and years as a junior high history teacher. Eventually, she left teaching and became a longarm quilter. In 2005, she became the co-owner and designer for Blue Underground Studios, Inc. Since then, she has published over 30 patterns and co-authored 2 books in addition to designing fabric for Riverwoods. Two of Amy’s loves are teaching and quilting, so naturally she loves to teach quilting! She is honored to be part of the faculty on this quilting cruise and can't wait to meet everyone! Enjoy this flower garden year round! 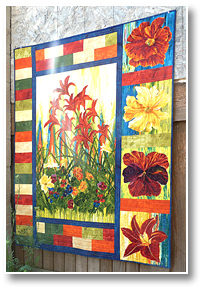 Large flower blossoms and tiles frame the Edible Garden panel on this lovely floral quilt which includes fabrics designed by Stephanie Brandenburg for Frond Designs. Finished size is 45.5" x 57.5". Note: This project will not be pre-cut in the Sail N Sew Fabric Pack because cutting it is part of the class. Matrimony is a dynamic contemporary take on an old favorite, Double Wedding Ring! It is created with templates and applique which eliminates curved piecing and the need for corner medallions. Finished size is 48" x 72". Do you love clean lines, strong graphic patterns and straight-forward piecing? This quilt is for you! Regatta blocks are strip pieced. 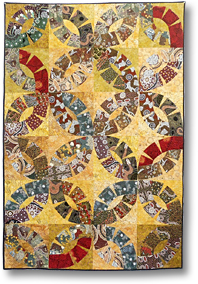 We’ll cover piecing and cutting tips in class as well as changing the look of your quilt with fabric/block placement. We will also discuss finishing options for your quilt. Finished size is 54.5" x 68". Fort Lauderdale lies along the Atlantic Ocean at the mouth of the New River, 25 miles north of Miami. Its warm tropical weather attracts many people throughout the year. For sun-worshippers, the city has six miles of beaches. There are also many recreational waterways with extensive boating facilities, access to every conceivable watersport, a variety of fascinating museums and trendy restaurants, and an array of entertainment venues. People have been flocking to Fort Lauderdale's beaches for decades. And with good reason. Fort Lauderdale Beach is a two-mile strip of beautiful beach featuring the recently renovated Promenade, which offers all sorts of bars, restaurants and shops. For a city now known for its warming sun and balmy breezes, Nassau has a tumultuous past. First settled by the English, the area was contested by England, Franceand Spain. For many years, Nassau was a home base for notorious pirates, and it was burned to the ground by the Spanish three different times. Since 1740 however, visitors from all over the world in search of both relaxation and adventure have made Nassau their favorite destination. Visit the luxurious Bahamian resort, Atlantis in Paradise Island. Interact with amazing dolphins at Atlantis Dolphin Cay, one of the largest dolphin habitats in the world. Register for the Aquaventure program, the premier water park in the Caribbean, and participate on a Discover Atlantis Tour. View more than 50,000 fascinating species of marine life in the largest open air aquarium in the world. When the Spanish closed their colonial fort on St. Maarten in 1648, a few Dutch and French soldiers hid on the island and decided to share it. Soon after, the Netherlands and France signed a formal agreement to split St. Maarten in half, as it is today. Philipsburg displays its Dutch heritage in its architecture and landscaping. The island offers endless stretches of beach, beautiful landscapes and great shopping. Snorkel at Creole Rock, part of a protected seashore! There has been a marked increase of sea-life returning to the rocky island over the past decade or so. It is not at all unusual to see turtles, rays, barracuda, tarpon and a wide variety of reef fish. One side is very protected, while the other is open to deeper water and all manner of pelagic life. Creole Rock is very popular, and is said to be the most varied and rewarding snorkeling site in and around the Grand Case Bay area. Return to Ft. Lauderdale, Florida. Winner of the Best Overall Cruise Ship award for two years running, Allure of the Seas is a captivating adventure unlike any other. Explore seven distinct neighborhoods filled with awesome new features – like the first Starbucks® at sea, dance and jive with Broadway hit musical Mamma Mia! and enjoy favorite moments with Shrek, Po the panda, and more friends in the DreamWorks Experience. Spice up your sailing with Mexican-fare favorites atSabor, or with prime cuts straight from the skewer at Samba Grill Brazilian Steakhouse. And there's still plenty more Oasis-class WOWs to be had, from the classic carousel on the Boardwalk®, to aerial acrobats in the AquaTheater, FlowRider® surf simulators, plus zip line views over Central Park®—a meandering garden lined with shops and fine restaurants. Here is a video about the Oasis Class ships and all the amazing things they have to offer. Port charges, taxes & fees of $337.50 are not included. Please call for other occupancy pricing. 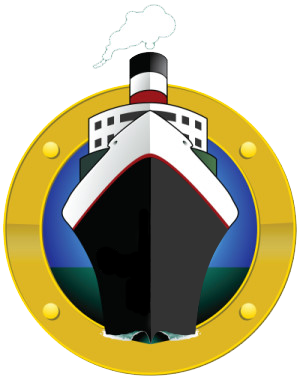 You will be responsible for getting to and from the ship in Fort Lauderdale, FL.